The Quinnipiac men’s lacrosse team fell short of reaching its goal last year: the conference title. The Bobcats came within one game of winning the Northeast Conference Tournament, but eventually fell to Mount St. Mary’s in the Championship game, 14-9. Last year’s Bobcats squad finished the season 7-7 including 4-1 in the NEC. The Bobcats won five of their last seven games to reach the title game. Last year, in the team’s first season in the NEC, head coach Eric Fekete directed the Bobcats to a share of the NEC regular season title. By virtue of a tie-breaker, Quinnipiac went into the tournament as the No. 2 seed and advanced to the finals with a comeback, double-overtime win over Robert Morris. 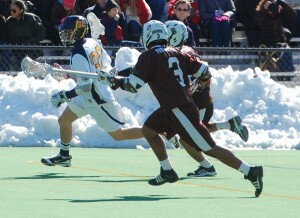 Freshman Pat Mulligan runs downfield in the team’s season-opener vs. Brown on Sunday. Mulligan is one of 23 freshmen on this season’s roster. This season, the Bobcats were chosen to finish in fourth in the NEC preseason coaches’ poll with Mount St. Mary’s, Bryant and Robert Morris finishing above them. Last season, Quinnipiac had five All-NEC selections: Kevin Kelley, Jake Oppenheimer, Christian Haggerty, goaltender Kevin Benzing and leading scorer Basil Kostaras, who recorded 26 points last season with 20 goals and six assists. With four of the five all-NEC selections having graduated, the Bobcats will look to Kostaras and senior defender Chris Coppolecchia to guide a young team this year and bring it back to the NEC playoffs. Kostaras, a junior midfield captain, has solidified himself as a player, according to Fekete. According to Fekete, Coppolecchia is the only player who starts that is a senior, having played in 38 career games with the Bobcats, including all 14 games in each of the past two seasons. Coppolecchia and Kostaras are two of the few players with substantial experience with the team, as the Bobcats welcome 25 newcomers, including 23 freshmen, who will compete for playing time. This season’s team is hungry to repeat last season’s success, but isn’t planning on just making the playoffs. Fekete knows that even though there are 23 freshmen, it comes with its advantages and disadvantages of having inexperienced players in the rotation. Of the 23 freshmen, about 15 will see significant playing time, while seven makeup the starting rotation, Fekete said. Part of the Bobcats’ rotation that is looking to make an impact is sophomore Brandon Kuring. Kuring faced some obstacles last season as he encountered a slew of injuries that didn’t let him see the field as much, making him play mostly some spot duty. Fekete is hopeful that when the automatic qualifier to the NCAA tournament comes into the conference next season that this year’s freshmen class will be confident to make a run when they are more experienced next season. Fekete and the Bobcats know that with such a competitive conference that the lessons learned from last year will help the team this season with such an inexperienced squad.